For STEM Friday we have a middle grade title Cool Plastic Bottle and Milk Jug Science (Recycled Science) by Tammy Enz. Tammy Enz has come up with nine intriguing science activities that reuse plastic containers. It's a win-win scenario because plastic containers provide inexpensive containers for science projects, and finding new purposes for water bottles or milk jugs keeps them out of the landfill. The instructions for the activities are short and clear. There's a list of materials you'll need, step-by-step instructions how to put it together, photographs showing the set up, and a brief explanation of what's happening. 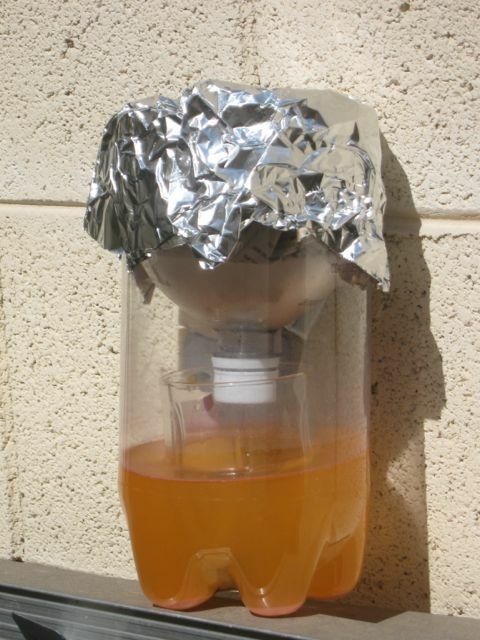 Activities range from making a cloud in a bottle in a few minutes to a longer term composting worm farm. Cool Plastic Bottle and Milk Jug Science is perfect for a busy educator who needs a science activity fast. The best part is the materials are inexpensive and generally readily available. If you are doing science with kids, it's a great book to have on hand. This video shows an easy demonstration of air pressure using plastic bottles. Who needs expensive glassware when you can replicate many of the same containers using plastic bottles. Here are two ideas to get you started. When you separate solid particles from a liquid by pouring the mixture through a filter, it is called gravity filtration. Generally filtration in chemistry involves special glassware, but for simple experiments at home you can use a large plastic soda bottle cut in two, with the top inverted into the bottom. Most soda bottles can be cut with household scissors. Place a coffee filter into the inverted top of the soda bottle, with the cap off. Fold or cut the top so it fits smoothly. Pour the liquid to be filtered through the filter. Larger particles will be trapped in the filter, and the liquid and smaller particles will pass through into the catchment container. Remove the filter and invert into a dish. Scrape off the solids with a spoon, if necessary. Certain brands of paper towels will also work as filters, but coffee filters are inexpensive and easier to work with. Distillation is a way to separate mixtures that takes advantage of differences in boiling point. The liquid leaves the mixture via evaporation and then the gas/vapor is captured again via condensation. Note: This activity works best outdoors on a hot, sunny day. You can set up a simple distillation apparatus using a soda bottle that has been cut in half. Leave the cap on. Place the mixture in the bottom of the soda bottle. Place an empty glass in the center. 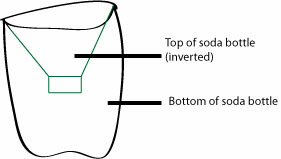 Invert the top of the soda bottle (with the cap left on) into the bottom half. Press down so it fits tightly and doesn’t allow gases to escape. Fill the top of the soda bottle with ice. Cover with newspaper (insulation) and then aluminum foil. Set in the sun. Visit regularly over the day and replace the ice as needed. The water should evaporate from the bottom, condense on the top and then run into the cup. Related: Previous review of Build It! by the same author, Tammy Enz. Disclosure: This book was provided by the publisher/author for review purposes. Also, I am an affiliate with Amazon so I can provide you with cover images and links to more information about books and products. As you probably are aware, if you click through the highlighted title link and purchase a product, I will receive a very small commission, at no extra cost to you. Any proceeds help defray the costs of hosting and maintaining this website.